Security centric issues, news and rants – and other things. 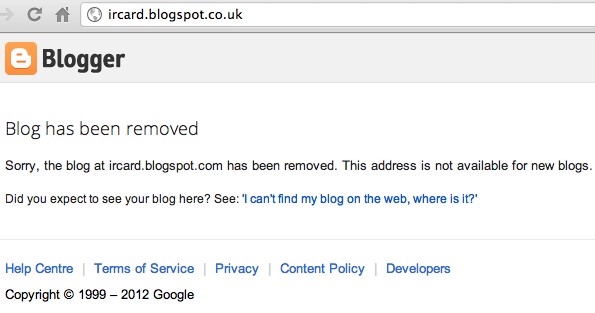 Whay my weblog was stoped from google site? Can you help me to solve this problem? I had about 1000000 viewer. Believe me, his English is infinitely better than my Arabic (which doesn’t exist). I couldn’t respond immediately because I was just about to board a peak-time train, and had neither elbow room nor a signal. It wasn’t until Monday that I managed to talk (despite an appalling telephone line) with Google’s Ryan Brack, Manager, Global Communications & Public Affairs. Personal and confidential information: It’s not ok to publish another person’s personal and confidential information. For example, don’t post someone else’s credit card numbers, Social Security numbers, unlisted phone numbers and driver’s licence numbers. Also, please bear in mind that in most cases, information that is already available elsewhere on the Internet or in public records is not considered to be private or confidential under our policies. My apologies – I’m having serious line problems ATM. The point I wanted to make is the [that] Zarefarid posted only part of the credit card numbers – enough for the user to recognize that he had them, but nor [not] enough for anyone to make use of them. This was a clear case of whistleblowing. He had attempted to report the issue through the official channels but was ignored. So he chose this way, but without actually endangering anyone’s personal information (or card numbers). That was more than 24 hours ago. No response whatsoever. I don’t believe that Khosrow Zarefarid breached Google’s policy, although he clearly went up to the line. In this instance he was trying to prevent ‘personal and confidential information’ from ending up on the internet. I also believe that under such circumstances Google has a duty to warn the blog owner and provide means by which the blog content can be retrieved by the owner (this may have happened without me knowing about it – but I doubt it). Blogger is a free service for communication, self-expression and freedom of speech. We believe that Blogger increases the availability of information, encourages healthy debate and makes possible new connections between people. We respect our users’ ownership of and responsibility for the content they choose to share. It is our belief that censoring this content is contrary to a service that bases itself on freedom of expression. In this instance it did not live up to this ideal. In this instance, Google fell far short – and I appeal to Google to reverse this decision and come to some arrangement with Khosrow Zarefarid. Freelance author and journalist. One time news reporter for Infosecurity Magazine. See Sample Work for sample work; and Editorial Services for, well, editorial services. Then contact me. This blog is moving to ITsecurity.co.uk, where it will be bigger and better than ever. Please join us. What’s with the TrueCrypt warning?